Kikkan Randall blazed a cross-country trail. Jessie Diggins followed it to history. DAEGWALLYEONG, South Korea – The unattainable had become inevitable, the magical had grown feasible and Kikkan Randall started screaming at the top of her lungs. She was standing under the lights, at the finish line of Alpensia Cross-Country Skiing Center, imploring her team sprint partner. She watched Jessie Diggins blaze around the final turn in intimate pursuit of the leader, a whoosh of Lycra and a blur of limbs. Diggins pumped her legs and thrashed her arms, stride for stride with Sweden's Stina Nilsson. Her thighs burned. "Go, go, go," Diggins told herself. Randall could not discern whether Diggins or Nilsson held the lead. History would be made. The frantic, furious final 100 yards would determine which kind. Diggins started the homestretch just behind. They traded the lead, seemingly every glide of their skis. Diggins moved ahead, first by inches, then by maybe a foot, never more. Diggins crossed the line 0.19 seconds before Nilsson, so close Randall could not be sure who won until she looked at a scoreboard above the grandstand. It showed a "1" next to "United States." Diggins could not feel her legs, numb from the frenzied, indelible sprint she had just completed. Randall screamed, ran to Diggins and tackled her. "Oh my gosh!" Diggins cried. "Did we just win the Olympics?" The thrilling gold-medal triumph of Diggins and Randall – an effervescent 26-year-old from Afton, Minnesota and a 35-year-old mother from Anchorage, Alaska – was many things, depending on perspective. By late Wednesday night, the participants were talking about the impact the race might have on cross country in the United States, and across the world. It was an improbable victory and a career achievement. It was a surpassing finish and a historic moment. It was, in Randall's words, "amazing validation." It was, in the longest view, a miracle. Randall had won her first Olympic medal at her fifth and final Games, in her 18th event – more than any other first-time Winter Olympics medalist. Diggins and Randall had won the first women's cross-country medal in U.S. history and the first country's cross-country medal for any gender in 42 years. In 2002, Randall and Norway's Marit Bjoergen both debuted at the Salt Lake City Olympics. Wednesday, Bjoergen won bronze with partner Maiken Caspersen Falla, which gave her the 14th medal of her career, the most ever among Winter Olympians. While Bjoergen was winning 14 medals, Randall was waiting for one. Diggins had made it happen with her 100-meter sprint. Randall had made it possible with the previous 16 years. "For the last 100 meters, I just gave it everything that I have," Diggins said. "Because when you have a teammate that you really love and you care about waiting for you at the finish, you're never going to give up." In 1998, Randall gave up her dream of running in the Olympics, switched to cross-country skiing and told herself she would win a gold medal at the Olympics in 10 years. The United States, for practical purposes, did not have a women's cross-country program. For several years, she was the only woman on the team, so she would travel around Europe with the men's team. In her first Word Cup race, she finished dead last. At the 2002 Salt Lake City Games, Randall finished 44th in her only race. "I don't even know if we were fielding a relay in the Olympics," Randall said. "We were excited if we got a top 30. It just seemed totally out of the realm of possibility." Year by year, it started to feel possible. The sport's governing body introduced the faster-paced sprint events, which suited her strengths. More women gravitated to cross-country. Randall won at the world championships in 2013. When Randall left Sochi without a medal four years ago, she felt disappointment. Entering Pyeongchang, Randall felt an almost cosmic presence. She had worn No. 5 when she played soccer, and she believed her fifth Olympics would deliver her medal. Before Wednesday, though, it had not been a good Olympics. In her three prior events, she had finished fifth, 16th and 40th. Teammate Sadie Bjornsen had skied faster. U.S. team officials debated whom to pair with Diggins in the team sprint. U.S. Chief of Sport Luke Bodensteiner, who first watched Randall ski when she was 14, believed the final climb on the course would be decisive. He trusted Randall most. "Kikkan kind of started all this," Bodensteiner said. 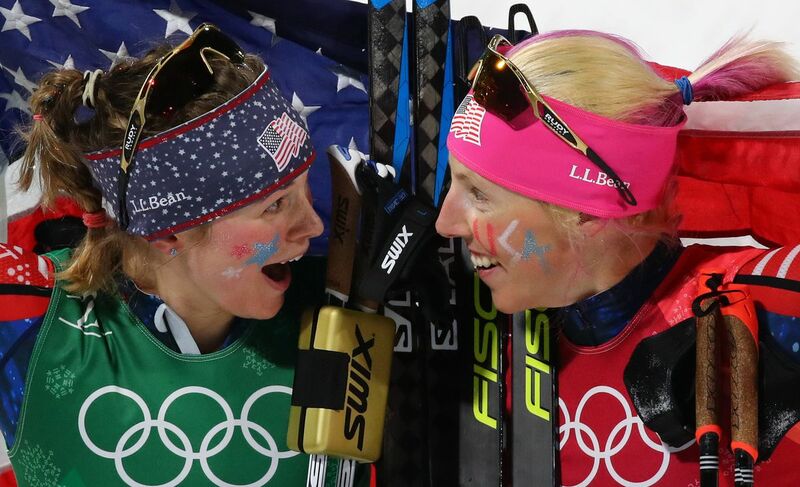 At their hotel Wednesday afternoon, hewing to prerace ritual, Diggins and Randall painted each other's faces with USA on one cheek and red, white and blue stars on the other. Diggins provides the glitter and sparkles, and she draws the "S" on Randall's cheek in the shape of a lightning bolt. "Sparkles and glitter has always been this promise to myself," Diggins said. "I'm going to go out there, and I'm going to lay it all down." Randall and Diggins each would ski three alternating laps. Randall placed them in contention with her first lap. On her second lap, Diggins pushed the pace to separate the top three teams. Randall's final lap effectively clinched a medal – history in itself. Diggins would determine which color. On the final downhill, Diggins slowed and tucked behind Nilsson, so she could draft off her and slingshot ahead of her up the last small hill. Around the penultimate turn, shaped like an "S," she left Falla behind and engaged with Nilsson. In practice, coaches race against Diggins for the final 100 yards of her laps, so she has to match their fresh legs with her dead ones. The drill annihilates Diggins's legs, but she does it for moments such as this one. "She's so tenacious," Bodensteiner said. "She's got this extra gear. When the chips are down, she finds it. And she will not let go." "As soon as they hit the lanes, I was like, 'There's a gold medal right there,'" U.S. men's cross-country skier Andy Newell said. "No way would Jess let anyone beat her to the line." "I could feel her behind me when the last 100 meters came," Nilsson said. "Today, she's stronger than me." When Diggins crossed, she and Randall fought tears. They stretched a giant American flag behind their backs, beaming. Randall found Bodensteiner, who had watched her build the moment from nothing. "We just cried together," Bodensteiner said. Late Wednesday, Randall and Bjoergen sat to next one another the podium. Bjoergen may be the greatest winter Olympian ever. Randall was a first-time medalist. On that night, finally, she was the best. "I'm very happy for her," Bjoergen said. "We both were in Salt Lake for the first time together. We had the long career together. She's a mom, too. So it's special to see her standing with me. "It's very good for our sport, too, that Jessie and Kikkan was there today. It's not good that it's only Sweden and Norway. I feel that we need some more." Randall believes more are on the way. She believes girls who saw her and Diggins win will want to try cross-country. Already, her shepherding of other American women into cross-country has surfaced. On a cold night on the other side of the world, Randall stood at the finish line and saw one coming at her, her skis churning, the lights glistening off icy snow, like something out of a vivid dream.